Samsung's Galaxy J line is quite popular among users who are looking for a brand device that's not too expensive. The J5 (2017) exhibits new materials and design compared to the previous generation. But how does it go about it in terms of performance? Let's find out. Which Samsung smartphones should you buy? 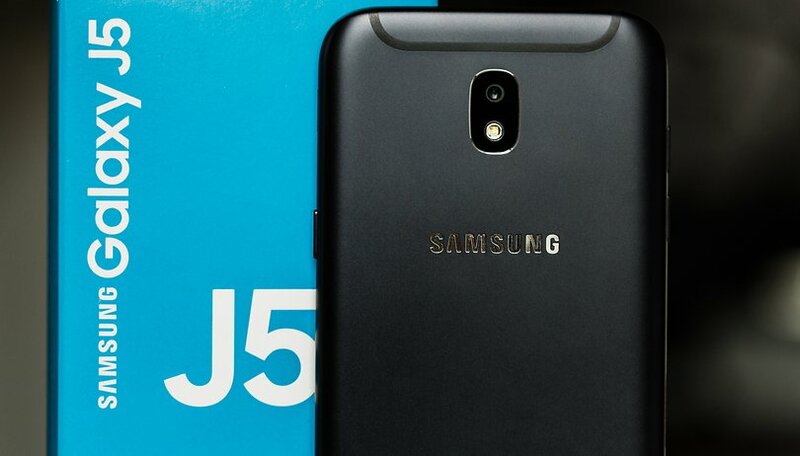 The 2017 generation of the J5 is sold in the US as the Samsung Galaxy J5 Pro (2017). It's available from Amazon for $204 in black, gold, blue and pink. It's also available from Samsung UK's website for £249 in black and gold, under the name Samsung Galaxy J5 (2017). There is only one model with 2 GB of RAM and 16 GB of internal memory, expandable via microSD up to 256 GB. Don't expect the same design, use of materials and build quality as the previous generation because Samsung has decided to improve the Galaxy J5 (2017). The smartphone abandons the plastic in favor of a body of 146.2 x 71.3 x 8 mm and 160 grams made entirely of metal. The design is not original, but you should appreciate the upgrade of the materials used and the good assembly. The J5 thus adopts a classic Samsung look, rounded corners, logo on the opaque case and above the display, power button on the right and volume control on the left. To insert SIM and microSD you will need to use the trays on the left edge, which can be pulled out with the pin included in the purchase box. The model I tested is the dual SIM version: the smallest slot is dedicated to the main SIM card, while the largest slot is dedicated to the second SIM card and microSD card. On the body you can see the thin black stripes of the antennas and the non-protuding camera section highlighted by the silvery frame. On the front you'll find the clickable home button that also acts as a fingerprint reader, also present in the J7 but omitted in the J3. Alongside the reader are the back and multitasking keys, but they are not backlit, a shame. The notification LED is also absent. The Galaxy J5 (2017) houses the speaker laterally on the right (as on the A series), while along the lower edge it leaves room for the headphone mini jack and miniUSB port (no Type C). The keys are all easily reachable, are solid and respond to commands. The smartphone guarantees good ergonomics and does not slip even when resting on flat surfaces. The general look is similar to that of the Galaxy A5 (2017) but forget the certification against water and dust. Included in the purchase package is the 1.55 A charger, the microUSB charging cable and a pair of headphones with microphone. The Samsung Galaxy J5 (2017) mounts a 5.2-inch Super AMOLED screen and thus sits between the 5.5-inch J7 and the 5-inch J3. The resolution is 720 x 1280 pixels in 282 ppi. The screen is pleasantly bright and can be read even in sunlight. From the settings you can set the brightness automatically and the brightness sensor does its job. The colors are bright, those typical of Samsung. From the dedicated menu you can balance colors to change the appearance of white tones, choose one of the four screen modes (Adctive, AMOLED Cinema, AMOLED Photos, Basic) and activate the blue light filter so you don't strain your eyes too hard during your nocturnal readings. The Galaxy J5 (2017), like its siblings, runs Android 7.0 Nougat. Samsung could not opt for the latest version of the software, but at least we find Samsung Experience in version 8.1. Security patches are stationary until June. Double Messenger (Settings>Advanced Functions) lets you create a second account for apps like Facebook and Skype. The interface is fluid and pleasant to use but don't expect a chip. The app drawer is accessible with a swipe upwards, but you need a side swipe to scroll between apps. Bloatware is limited to brand apps, Google, Upday for news management and the Microsoft app package. Pre-installed apps cannot be uninstalled but disabled by pressing and holding for a few seconds. Like the Galaxy A, you can enjoy Game Launcher and secure your content in Personal Area. The possibility to customize the color of the folders with a simple tap. With a side swipe on the unlock screen you can manage the songs you are listening to. I was surprised to find the Dual Messenger (Settings>Advanced Functions) that allows you to create a second account for apps like Facebook and Skype just like with the Twin App on Huawei devices. 16GB of internal memory isn't much but with the use of microSD you won't have any space problems. Apps open a little bit slowly. It's a smartphone that isn't designed for intensive multitasking or gamers. It's got NFC. The Samsung Galaxy J5 (2017) incorporates an Exynos 7870 octa-core 1.6GHz processor flanked by the Mali T830MP2 GPU T830MP2 graphics drive, 2GB RAM and 16GB ROM. Performance is good for a processor and device of this range. This means that in everyday use, such as managing emails, calling, swiping, scrolling through Facebook, web searches and videos, you won't have any problems. The fingerprint reader is not one of the fastest but during my test it did not make a mistake. I found it convenient, as on the A5, the speaker placed on the right during the playback of videos or games less demanding. The NFC is present but, compared to the A series, there is no Always On that you can still have by downloading a dedicated app from the Play Store. The Galaxy J5 has a single speaker placed on the right that doesn't disappoint in terms of audio experience but doesn't work miracles. I found the maximum volume a bit low but, moreover, it's not a smartphone designed for multimedia and during calls you won't have any problems with volume or reception. Accessing the Audio Quality and Effects submenu you can put your hand on the equalizer to handle bass and treble, allowing you to customize the audio to your preferences. There's also integrated FM radio. The Samsung Galaxy J5 (2017) improves in the photographic sector compared to the previous generation: there are two 13MP cameras (S Sony IMX258 sensor) with f/1.7 on the back and f/1.9 on the front. Alongside the LED flash this provides good shots when the light is good. When light conditions deteriorate, the results are affected. Considering the range of the J line, the results are good. With a swipe from right to left you can access real-time effects, a nice feature for those who like to share their shots on social platforms, including basic Pro mode that allows you to customize some parameters such as ISO and white balance. The selfie quality is good and the colors are close to the real ones. With the Galaxy J5 (2017) you can shoot 1080p videos. The 3000 mAh battery is one of the strengths of this smartphone. Coupled with an undemanding HD screen, it can guarantee an average of one and a half days with standard use of the device that reaches up to two if limited to calls, whatsapp and a few Facebook checks. In our PC test Mark the Galaxy J5 (2017) reached 9 hours and 9 minutes. In our PC Mark test, the Galaxy J5 (2017) reached 9 hours and 9 minutes. If you're looking for a better performing device, you can stay with your family and focus on the cheaper J3 that has achieved a 12 hour 33 minute result. Unfortunately, the J5 relies on the almost outdated microUSB port for charging. Charging your smartphone completely takes about 2 hours. The Samsung Galaxy J5 (2017) offers a more elegant design than the previous generation and houses the fingerprint reader. Overall it is an improved version, able to satisfy less demanding users (gamers stay away from this device). Good battery life guaranteed and nice shots in good lighting conditions; even more surprisingly, the selfie is surprising. I don't understand why Samsung has decided to discard the notification LED and I understand the list price even less, as it's difficult to digest for a low end smartphone. On the hardware and software side, there's nothing mind-blowing and if you find it online for less than $250 (it's only $204 on Amazon right now), it's worth thinking about it, hoping that with prolonged use it doesn't slow down too much. If you find it for over $250 online, it doesn't quite have enough to justify its cost over alternatives such as the Moto G5 Plus or Huawei P10 Lite. If you can, get the J530Y with 3GB RAM and 32GB of storage. I imported this device into the UK and am very happy with it. If I have a criticism it's that the call quality is a bit average, almost as if the audio has been a bit bandwidth limited. Other than that it's great for the money. On the specs it's no bargain at the price, where Moto G5 offers 32gb on a good device, for the same money (and on big Xmas discount now). Samsung is increasingly trying to build an "ecosystem" (e.g. Bixby) and is generally more intrusive about bloatware than I like at this price point, where the closer to clean Android the better.